Temporary Bleachers: a chicago cubs blog » Temporary Bleachers? Why name my site ‘Temporary Bleachers’? Simply because, in the context of Chicago Cubs history, building temporary bleachers at Wrigley Field means a World Series will be played there. Building temporary bleachers was a common way to boost capacity in the first half of the 1900’s, even going so far as build structures on roped-off parts of the playing field at some of the larger parks. On September 15, 1929, a permit approved by the Chicago city council went into effect that closed down Waveland and Sheffield Avenues for a period of three weeks to allow for the construction of temporary bleachers behind the outfield walls of Wrigley Field. At the time, the Wrigley bleachers resembled the current ‘beach’ bleachers at PetCo Park - they started at field level, went 17 rows up and were separated from the field by a walkway and fence. 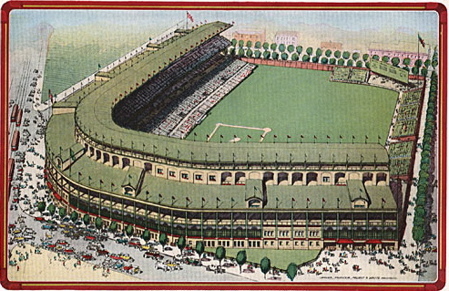 The park’s total capacity had just been increased in 1927 to about 40,000 after completion of the upper-deck grandstands, with the permanent bleachers seating only 2,000 of that. Large wooden platforms were built, extending from each grandstand down to the old scoreboard and jutting between 60 to 70 feet out onto the streets. Any trees that were planted along the sidewalks had to be cut down. ‘Circus’ benches were then constructed, matching the slope of the existing bleachers. The new seats towered over the ones below them and allowed 8,000 more fans into the game. For the 1929 series against the Philadelphia Athletics, all general admission bleacher seats were sold on game day for $1. People camped out in the freezing cold for as many as 15 hours before the gates opened at 8:30 a.m. for the 1:30 game. The high priced ‘box chairs’ in the grandstand went for $6.60 (up from the regular $1.50) but were sold in strips of three games for $19.80 (anywhere from one-third to a half of the common worker’s weekly wage). 50,740 saw the first run of the series blasted 427 feet into the bleachers in the 7th inning by Jimmy Foxx off Cubs pitching star Charlie Root. The Cubs lost both of their home games and lost the series 4-1, never getting to return to Wrigley that season. The paid attendance for both home games was 100,727 with receipts totaling $437,018. The cost of erecting the wooden bleachers alone totaled $33,000, not to mention the extra ushers and security needed, so the team was looking to take a loss even if the series went a full seven games. Even though the Cubs sold out all 10,000 extra seats for the two Wrigley games, thanks to the way the financials of the game were set up, only received $1,600 for their trouble. After all the organizational costs, not to mention having to refund all of the Game 3 tickets sold in the strip, the Cubs made a profit of about $8,000. Luckily, there was a precedent of the League voting it’s series representative club an additional $25,000. This helped the Cubs’ margin of profit for the series, but it was still so small that it was easily surpassed by the club’s profits from the Cubs/White Sox exhibition city series of 1931. For the 1932 World Series against the Yankees, around $40,000 was spent to rebuild the bleachers, this time built to seat around 10,000 extra patrons. It was in Game 3 (the first of that series in Wrigley) that spectators saw Babe Ruth’s “called shot” sail between the bleachers and scoreboard and hit the box office at the corner of Sheffield and Waveland. What never seems to get mentioned is that the next batter, Lou Gehrig, knock a ball almost as far, up to the top of the temporary right field seats. It was a shot that also knocked Cubs pitcher Charlie Root out of the game. Of the 49,986 in attendance at that game was New York Governor Franklin D. Roosevelt accompanied by Chicago Mayor Anton Cermak, who shook hands with both managers before the game. They, however, did not sit in the bleachers, sitting comfortably behind the screen near the Yankee’s dugout. 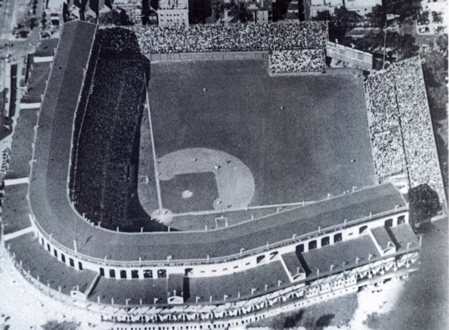 In 1935, the Cubs were to face the Tigers in the World Series and plans for temporary bleachers were made again. Contractor R. C. Wieboldt Company started construction of each 800 foot wooden structure as soon as the last home game at Wrigley was cleared of fans. 12,000 extra spectators would be allowed into the park this time. For the third straight time, the Cubs managed to play only 2 World Series games in Wrigley Field, losing in Detroit after six games. In Game 5, the last game of the series in Wrigley, attendence was 49,237. Not even a week later, there was no evidence the giant wooden platforms were ever there, the lumber having been dismantled and sold. While I’m sure the Cubs fans appreciated the extra capacity, the addition of the temporary bleachers to Wrigley Field always ended up being a financial loss for the organization. The current bleacher configuration was built in 1937, along with the famous brick wall and hand-operated scoreboard, bringing the bleacher capacity to 5,000. By the time the Cubs reached the World Series again in 1945, the expenditure was deemed to great and unnecessary. It seems they did find room, however, for 4,000 more box seat chairs and a way to stuff the place with 41,708 fans for the final game of the series. The temporary bleachers at Wrigley Field are an interesting footnote that I ran across while doing my research. All of the information in this article comes from the original Chicago Tribune articles of the time, as all of the Cubs books I have read so far only give them a passing mention. Plus, I didn’t want to create another blog with the words ‘Cubs’ or ‘Baseball’ in the title.